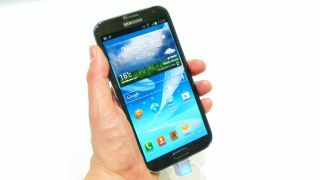 Does the Galaxy Note 2 tempt you? Traditionally tech companies like to launch products at the start of the year, get them on sale by summer and make sure they're all reviewed and in stock for the Christmas silly-season. Some firms like to buck that trend though, with the likes of Apple and Amazon preferring to launch certain products in late summer and getting them on the shelves before the leaves start dropping off the trees. This autumn is going to be particularly busy in the tech world with the launch of Windows 8, iPhone 5 and Kindle Fire 2 HD as well as dozens of Windows 8 tablets, laptops and ultrabooks and assorted Windows Phone 8 and Android handsets. Some might mock it's mighty screen size, but the original Galaxy Note was (is) a brilliant smartphone. If your hands are big enough to wield it comfortably, it's a perfect device for web browsing, social networking, note-making, email-writing, phone-call-making, film-watching… And so the Galaxy Note 2's juiced-up power, even sexier screen and Jelly Bean OS makes it the most dazzling and impressive handset ever designed. It's not for everyone of course, but as a mobile device it's simply unmatched on features or function. Get this to the £30 mark on contract (or around $399) and, coupled with some serious marketing again from Samsung, we should have a winner and a bumper-seller on our larger than average hands. Amazon introduced a new, larger screened Kindle Fire Thursday, the Amazon Kindle Fire HD. The new device's screen is 8.9 inches, making it the largest tablet Amazon's offered to date. Weighing in at 20 ounces and measuring 8.8mm slim, the high-def's display is 1920 x 1200 with 254 ppi, while the 7-inch version has a resolution of 1280 x 800. An OMAP 4470 processor by Texas Instruments powers these HDs while they can switch between a 2.4 GHz network and a 5 GHz one, depending on reader needs. The 7-inch slate, starting at 16GB, costs $199 and ships Sept. 14. The 32GB version runs $249. For $299, consumers can pick up the 8.9 incher with 16BG or a 32GB for $369.The UK will see the upgraded Kindle Fire (£129) and new 7-inch Kindle Fire HD (£159 for 16GB, £199 for 32GB) October 25. Nokia is being frustratingly precious about its phones at the moment – surely Windows Phone 8 should be more ready for at least beta testing by now – which means forming a decent opinion on the new phones is difficult to say the least. But the Nokia Lumia 920 is a good phone from the outset, although it didn't really give us much to feel wowed by. While many readers will be able to easily tell the difference between this and the Lumia 900, whack Windows Phone 7.8 on the older model and place them next to each other on the shop shelf and see if consumers are bothered to find out the difference between the two. Nokia's Pureview, Drive, Maps, Public Transport and Music are decent apps to differentiate in a crowded market, but we can't help but feel that this may not be enough of an evolution to really take Windows Phone to the next level. Amazon founder and CEO Jeff Bezos took the stage at a Santa Monica, Calif. event on Thursday to introduce the 6-inch Kindle Paperwhite, the next iteration of the company's iconic brand of ebook readers. The most important factor of any device that you're going to be staring at for hours on end is the screen, and the Kindle Paperwhite sports a new display with the highest contrast and resolution and least glare of any Kindle screen yet. The little brother to the brand-leading 920 above, we can't help feeling like the Nokia Lumia 820 should feel a little more premium, in the same way the 800 was mostly a shrunken down version of the 900 with something of the same clout. The Lumia 820 will live or die by its price; get this under £200 and there could be a seriously good phone out there, but if it's more aimed at the premium user we can't see why you wouldn't opt for the 920 unless you love microSD slots and hate larger screens.